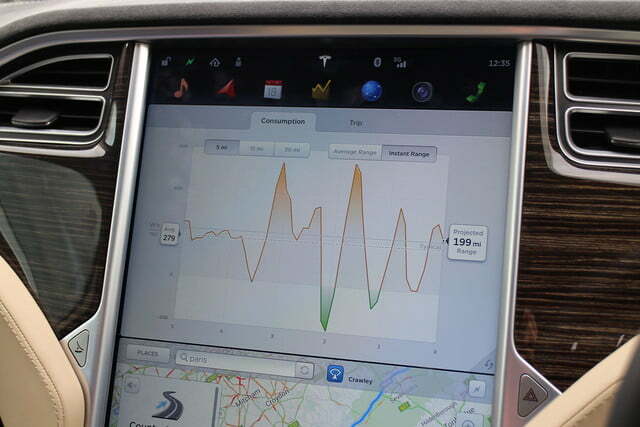 The first time exploring a Model S is like getting to know a new gadget, to the point where how it drives comes way down the list of questions, queries, and observations. Not that any of it is confusing, it’s just technically dense, and getting caught up in how to alter particular settings is all too easy. It’s a huge concern. It is, after all, a car, not a smartphone. Vision-warping acceleration that doesn’t stop. It would be a crushing disappointment – after playing with the toys – if it wallowed about like a sperm whale and had the precision and control of a puppy on a shiny floor. Then consider that it’s a platform that potentially reflects the future of personal transport, developed by a company that doesn’t have a century’s worth of experience creating motorcars, so it may not be that refined. Surely these are not good signs. 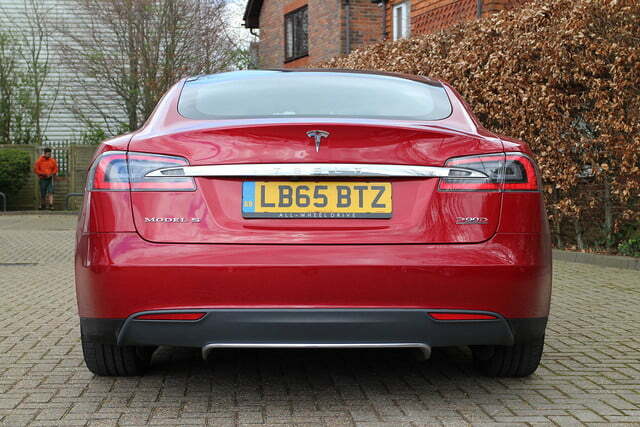 It turns out, however, that after spending some time in the Model S, it’s best to throw away any preconceptions, because it’s superb. Yet the most striking thing about it is not the speed, technical prowess, handling, or comfort; but that it does everything in one relatively innocuous looking vehicle. 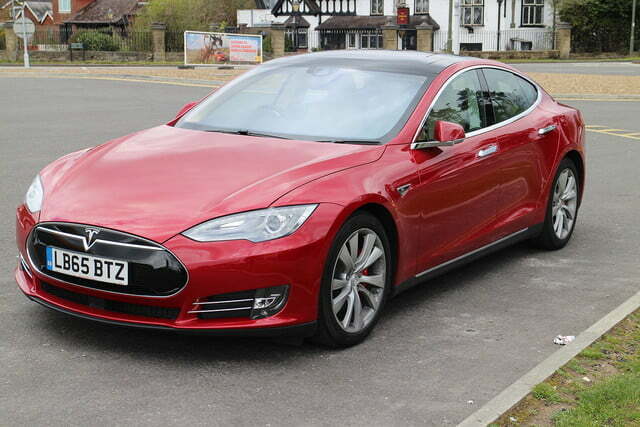 We spent a few hours driving around in a Tesla Model S — the P90D to be exact — and came out the other side shocked by the normality of such an abnormal car. 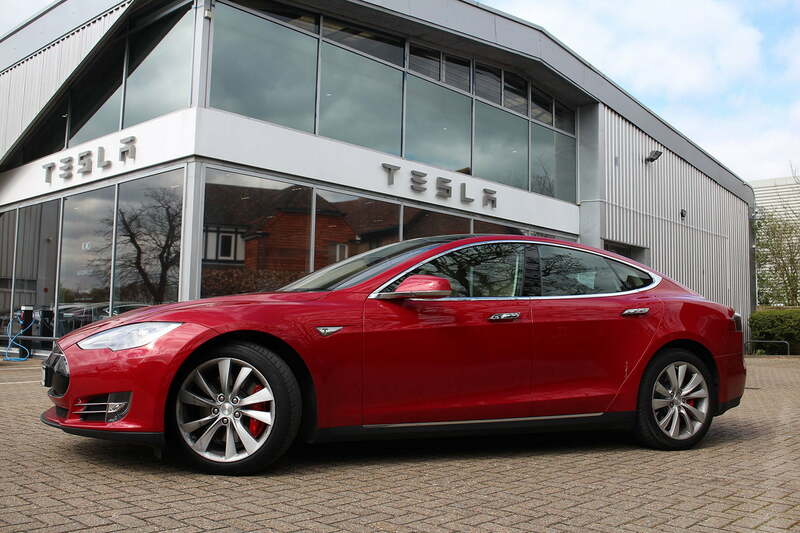 Tesla launched the Model S back in mid-2012 in the U.S., but in the U.K., where we drove our car, deliveries only began in mid-2015. 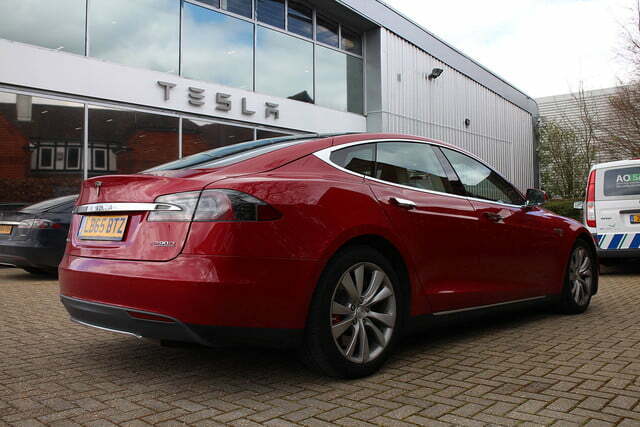 The P90D was also introduced in 2015, and is the model with the highest performance, boasting a 90kWh battery pack and all-wheel drive from two electric motors. 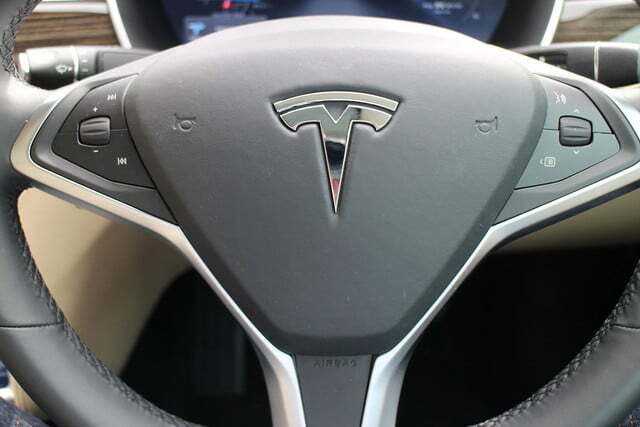 This particular car has the so-called Ludicrous Mode setting installed, giving it the equivalent of 762 horsepower, and a 0 to 60 time of 2.8 seconds. That’s hooligan-level performance, and usually found in cars covered in wings, flaps, slats, and splitters, while the interior would have seats only suitable for the very narrow-bottomed. 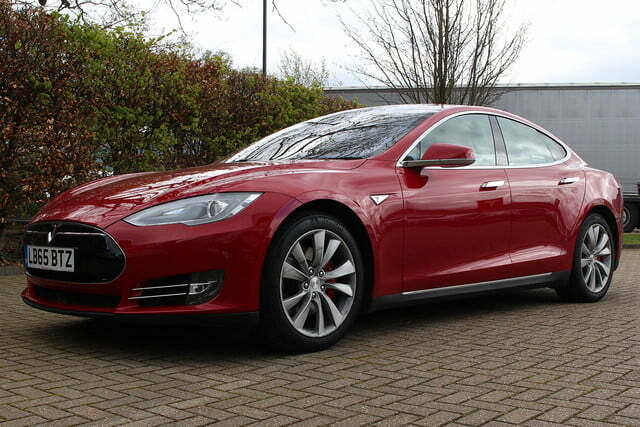 The Model S’s style is restrained to the point of being chained down. 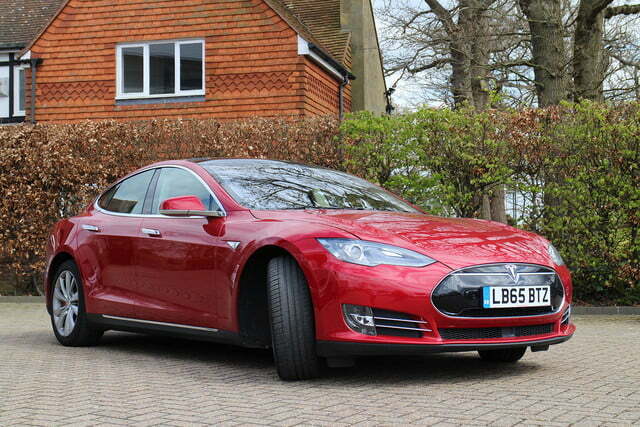 It’s not an overtly pretty car, but the body is curvaceous and well-proportioned, with an air of executive style. I like it. It blends in with the traffic, only turning the heads of knowledgeable car fans who happen to catch a glimpse as it glides past. If you told someone in a bar you owned a car that did the 0 to 60 sprint in under three seconds, this would not be the vehicle they would expect to see. For some, that will be a deal breaker. 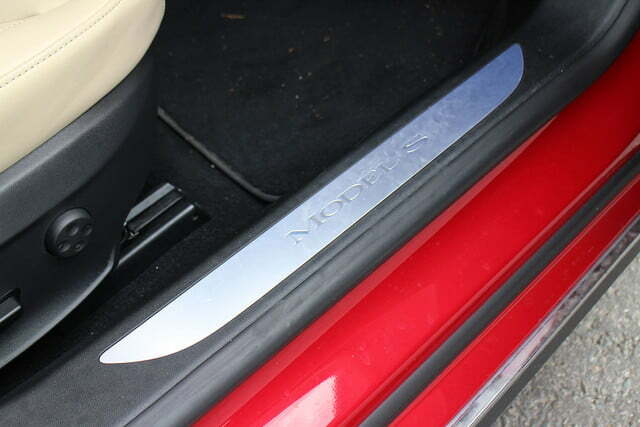 There are cool little touches though. 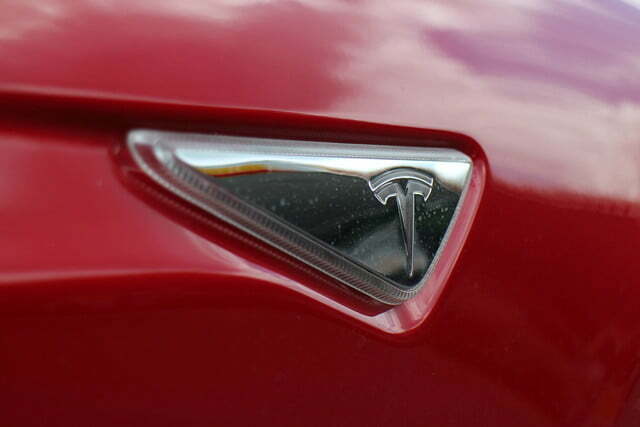 The side-repeaters have the Tesla logo, as do the brake calipers, and the flush door handles either pop out as you approach the car, or require just a brief touch to spring free of the door. 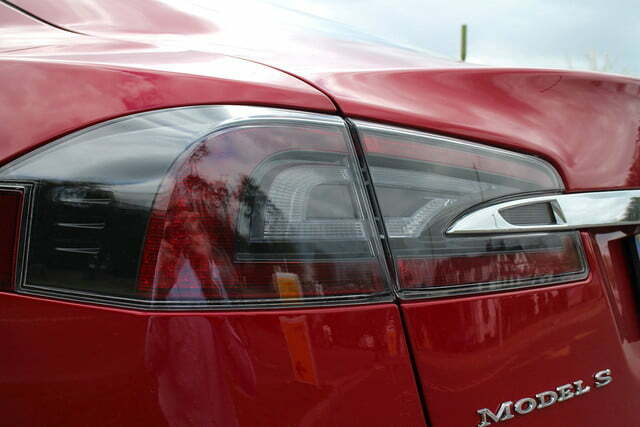 The flap over the charging port, which is in the passenger side rear light cluster, is the same — point a Tesla Supercharger cable at it, and it automatically opens willingly. 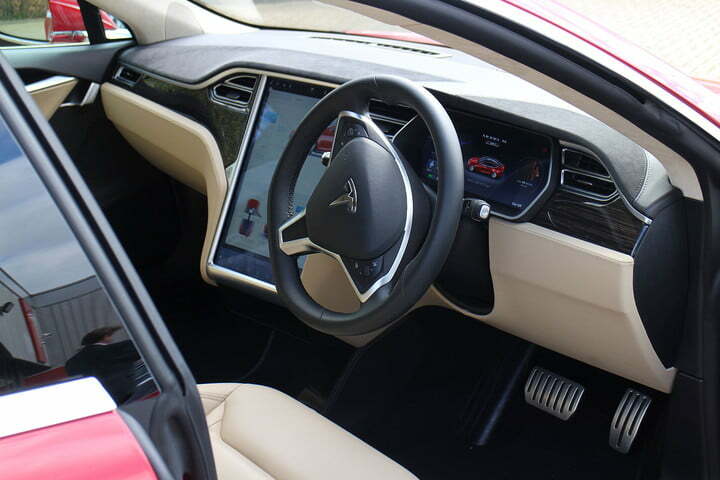 Sit inside and your forward view is dominated by a giant, 17-inch tablet-like touchscreen in the center of the dashboard, and an all-digital display behind the steering wheel. 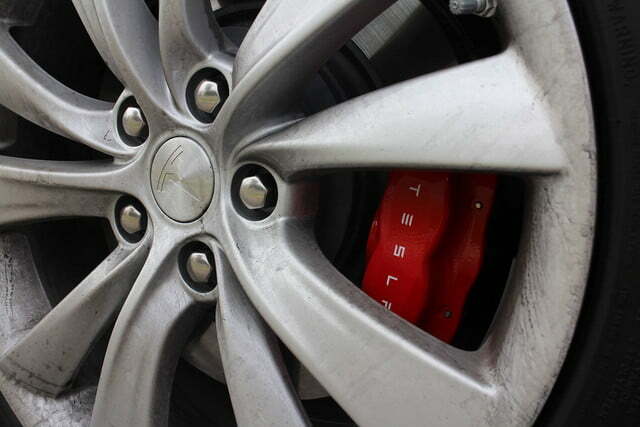 The wheel itself is glorious — fat, beautifully curved, wrapped in soft alcantara, and exactly the right size. 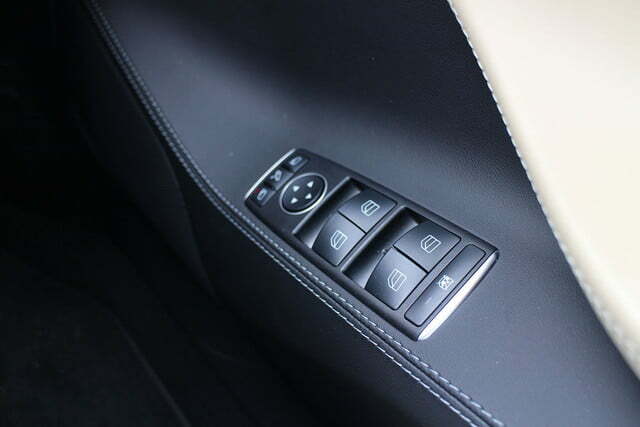 Despite not being particularly cosseting, the leather seats have strong side-support, with extensive electric adjustments, including in the lumbar and thigh regions. Mess around with it, and your perfect driving position will be found. The rear seats are slightly less successful, mainly because support is limited and the leather is slippy, so spirited drivers looking in the rear-view mirror will regularly see passengers slide from one side to the other. 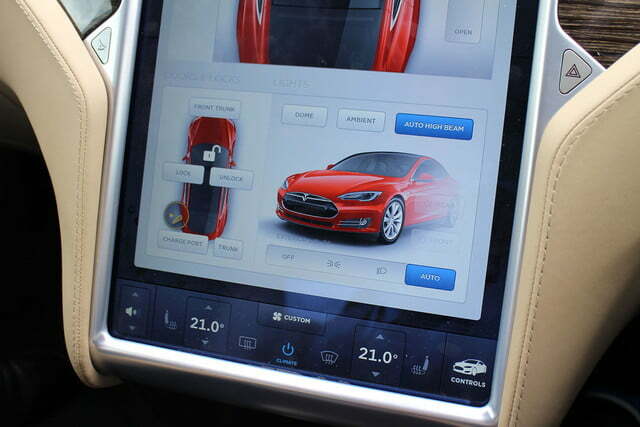 Almost every aspect of the car is controlled with the touchscreen, from the radio to the ride height, using an operating system that feels very similar to Apple’s iOS on the iPhone and the iPad. Buttons and fonts are large and clear, and two “apps” can be run on the display, stacked vertically, or presented fullscreen. 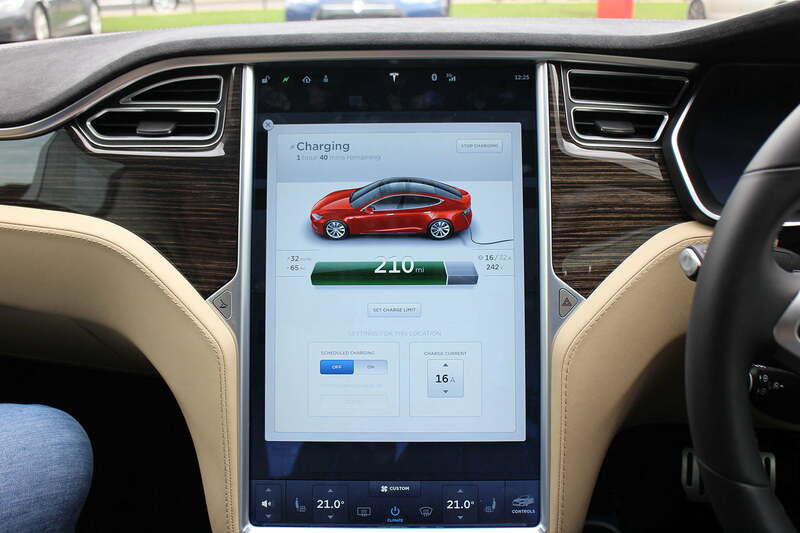 The car has a 3G wireless connection to power a browser, navigation, and even software updates, but it’ll also connect with Wi-Fi, and with your phone. Going through the settings and alterations while stationary is a breeze, and will present no problems for anyone who has used a smartphone in the last few years, but it’s a different story on the move. Perfectly usable everyday, but flexibility to cover long distances in one go is obviously not there. There’s no haptic feedback, no knobs or buttons to grab on to, and no way to tell what you’re doing without looking at the screen. This means you take your eyes off the road, and it feels unsafe. 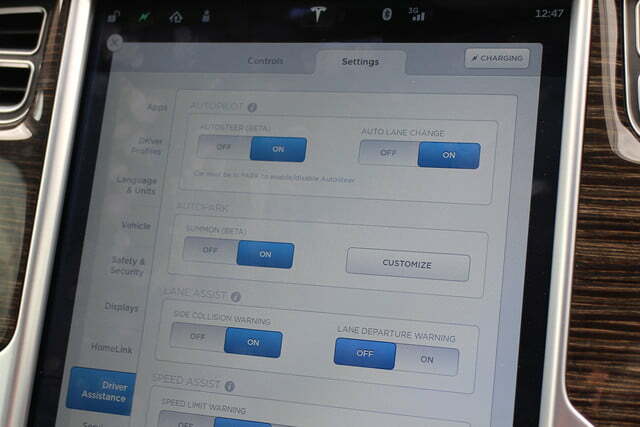 For example, the controls for the air-conditioning are at the bottom, and the X button to close the settings window is small and in the top left of the screen. 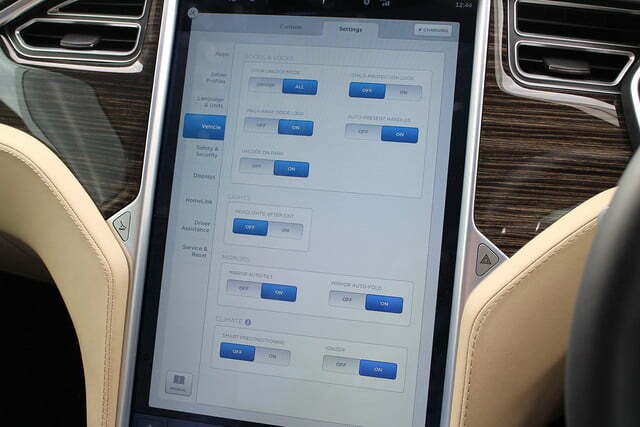 That probably works better in left-hand drive cars, but it’s a real pain in right-hand drive models. 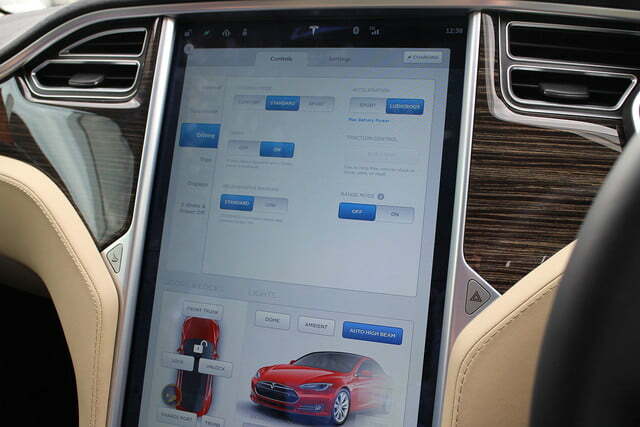 Interestingly, the Model S’s most successful and intuitive in-car feature is activated with a physical control on the steering column — Autopilot. 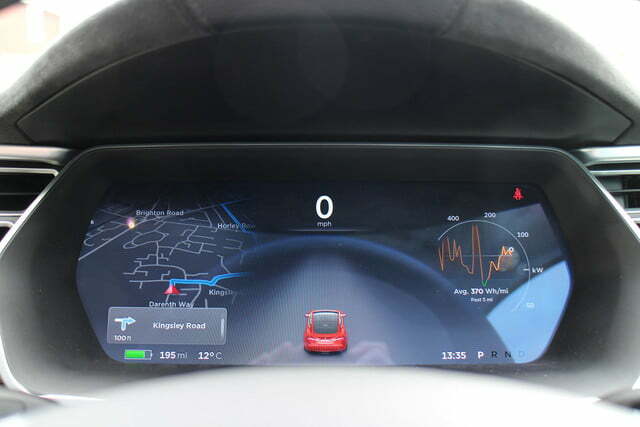 This doesn’t quite turn the Model S into an autonomous car, but it’s pretty damn close, and certainly a precursor of what could come in the future. Two pulls on a small stalk underneath the indicators on the steering column activates Autopilot, which sees the car accelerate to the speed limit, or whatever you set it to, then steer itself by tracking the white lines on the road. It’s shockingly effective. Law requires U.K. drivers to have their hands on the wheel, but it doesn’t feel necessary. 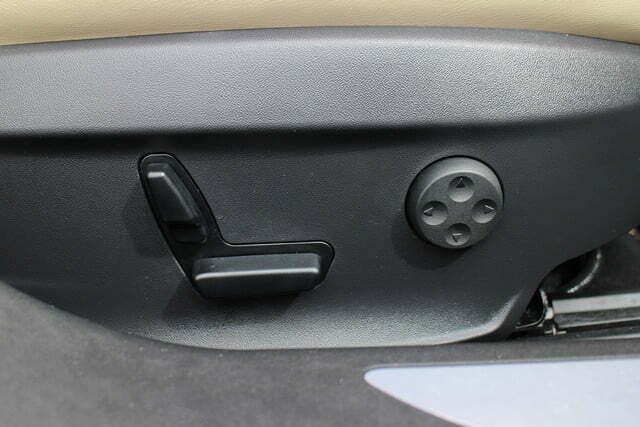 The car’s constantly making tiny alterations to the direction, which can be felt through the wheel, and any big changes are slow, smooth, and deliberate. Flick the indicator to change lane, and the Model S moves out by itself, accelerating past slower traffic if necessary. Again, the lane shift feels natural, and as a passenger, it was impossible to tell the difference between me doing it and the car. 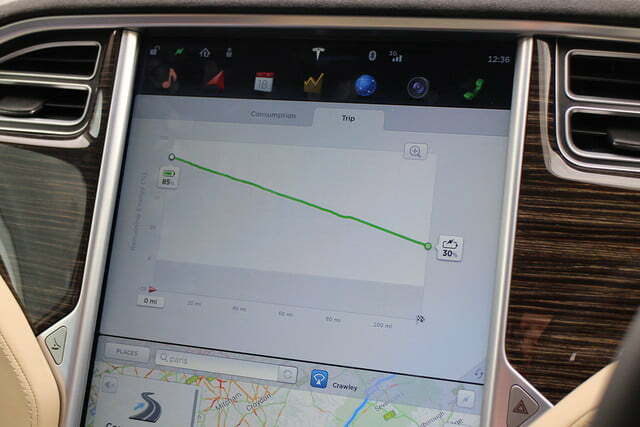 Tap the brakes or press the chrome button on the stalk to cancel Autopilot. 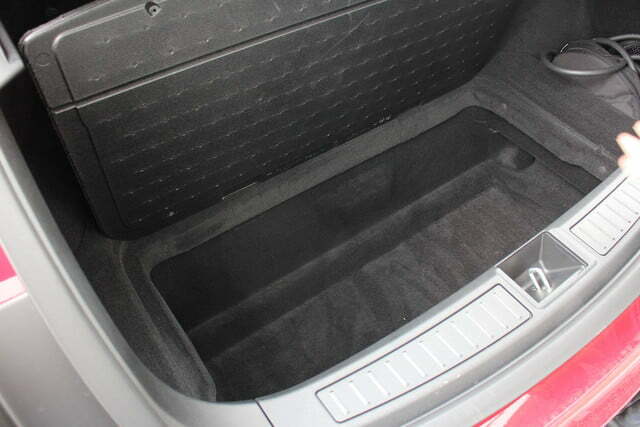 The car will also perform complex parking maneuvers, including getting itself in and out of tiny spots. Autopilot is a meaningful step beyond cruise control, incredibly easy to use, and not even slightly disconcerting. 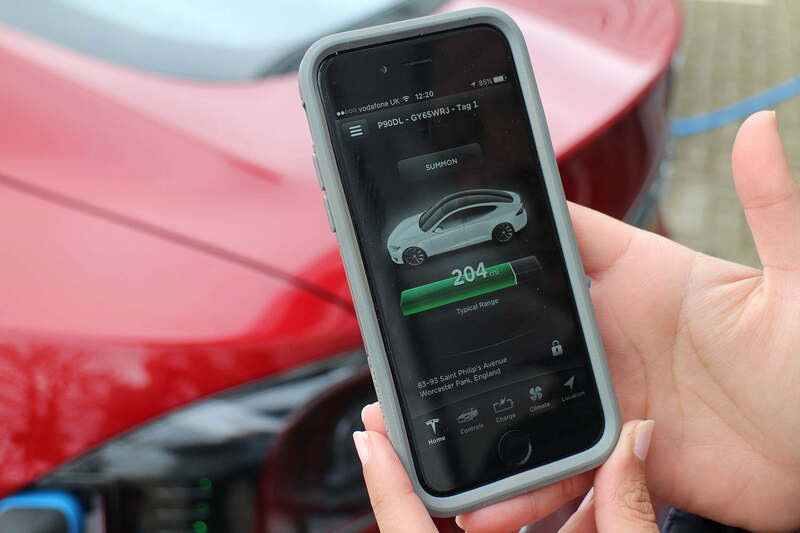 You’ll use it way more than you expect, but that would be a shame, because the P90D feels like it was made for us to drive. Most of the time, the P90D is very civilized. I could put my grandmother inside, and not only would she have been perfectly happy, there would be many compliments on the sensible ambience. That is, right up until I floored the throttle, and subjected her aging neck to a claimed 1g of acceleration. 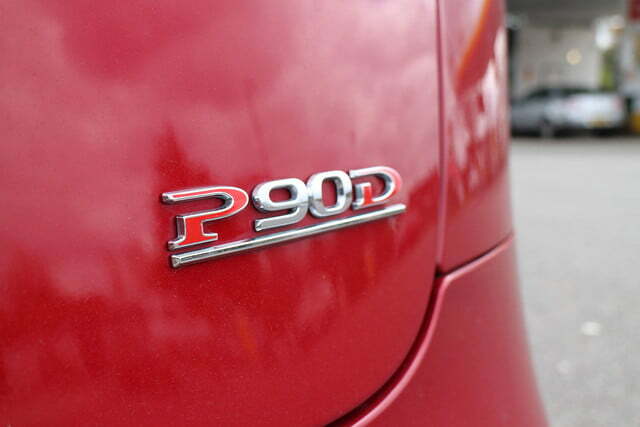 The P90D isn’t a mad dog, it’s a purebred greyhound rocketing straight out of the gate. 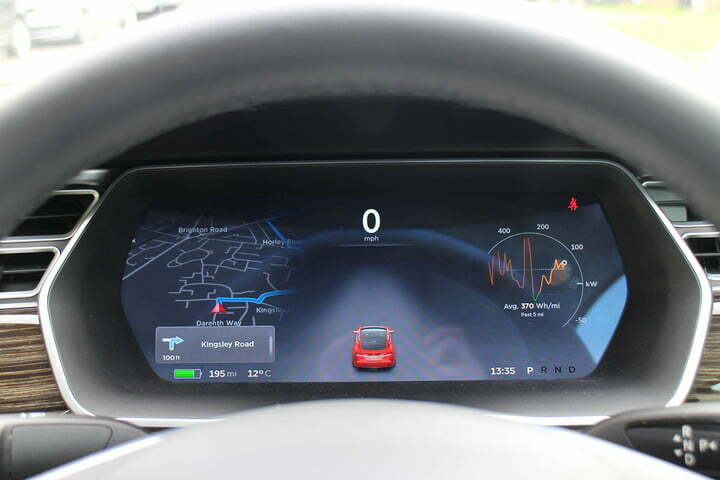 Autopilot is a meaningful step beyond cruise control, incredibly easy to use, and not even slightly disconcerting. There’s no savagery to the continued piling on of speed. There’s no barking exhaust, no tire-squealing insanity, or excitement-dampening turbo lag; just vision-warping acceleration that doesn’t stop. It’s one giant, endless glob of torque propelling you down the road at a pace that will embarrass almost any other car you meet. It’s not like an automatic car either, with no torque converter struggling to keep up, or kick down needed to get the fun started. It just goes. You’ll smile, passengers will whoop, and grandma will never forgive you. 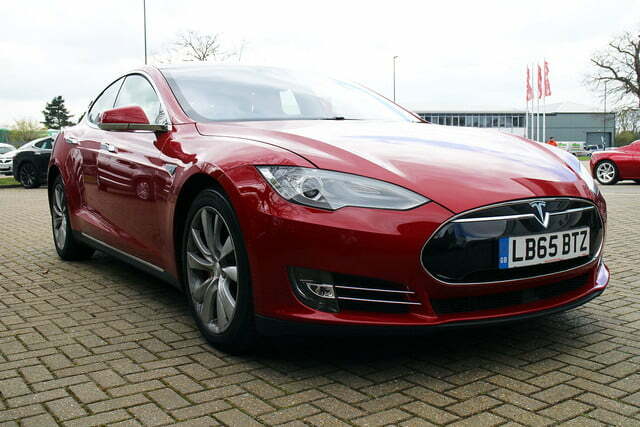 The all-wheel drive is partly responsible for the Model S’s stupendous acceleration, and also in keeping the car firmly planted on the road. We never tackled any twisty U.K. backroads, but it cornered flatly and without fuss on main roads at speed. 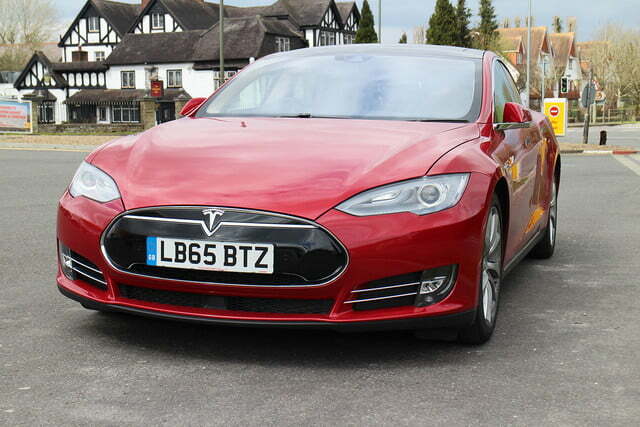 The car is wide though, and threading it down small streets will undoubtedly be a challenge. 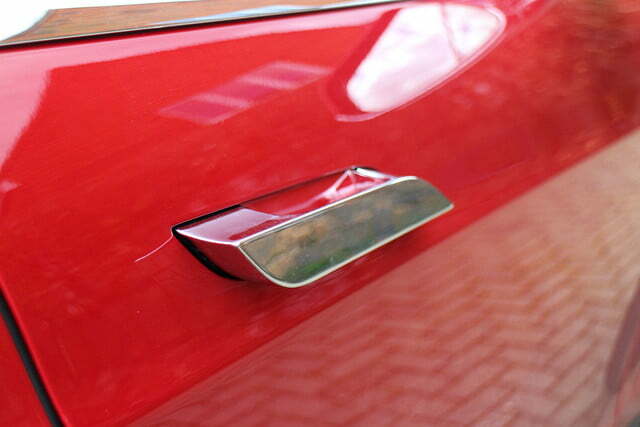 To keep you out of trouble, there are 12 different sensors around the body, which on the digital display, show how close you are to scrapping the bodywork. 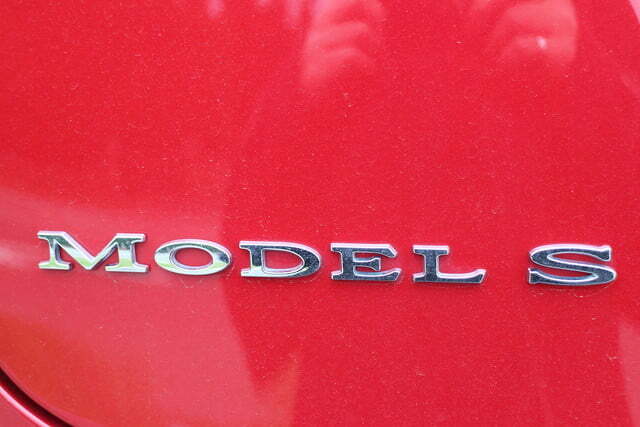 Keeping the steering in Sport mode was an essential, otherwise it felt overly assisted, and the regenerative braking on Low, which slowed the Model S subtly when you take your foot off the pedal, in a fashion that was uncannily close to a regular car. Leaving it in Standard mode will recover more energy, but the braking force is more severe, and may take drivers unaware. 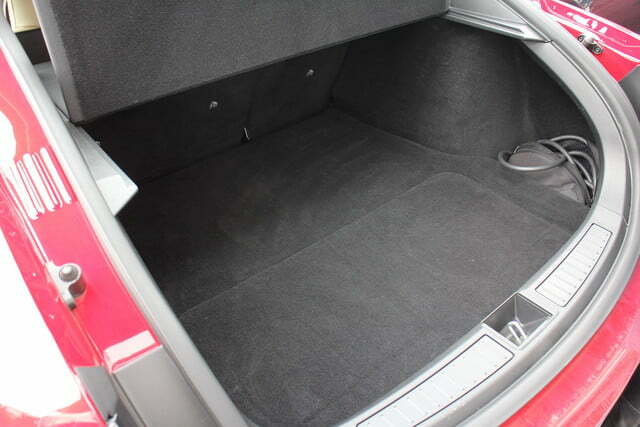 The Model S will seat five adults easily, with a cavernous trunk, and even more storage under the hood. 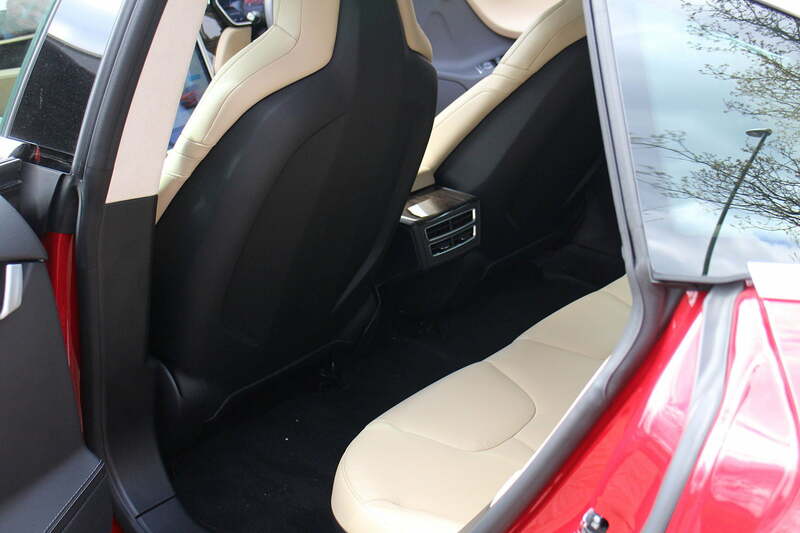 The interior is airy, spacious, and very comfortable whether you’re in the front or the back, where there’s masses of legroom. 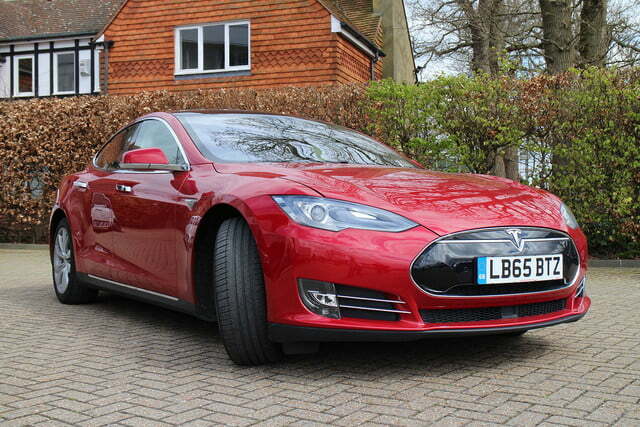 The electric motor is almost silent, tire roar and wind noise is minimal, but actually quite welcome, making the transition between internal combustion and electric less of a shock to the system. 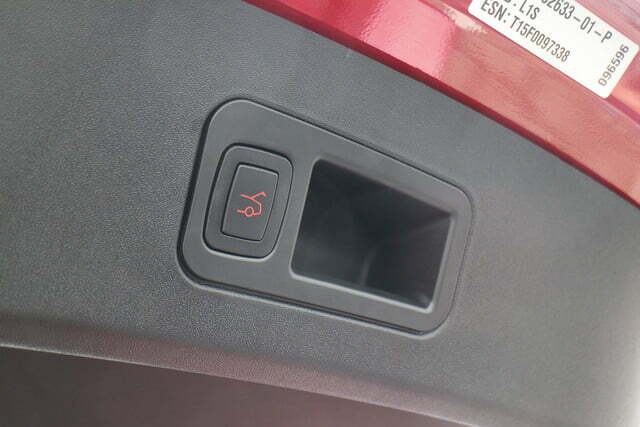 Visibility while reversing isn’t great inside, but a rearview camera feed on the touchscreen makes it easier. You want one, we can tell. Except we haven’t talked about the compromise you’ll have to make in order to enjoy the Model S. It’s an electric car, and while it’s unfair to call this a downside, charging is a major ownership consideration. 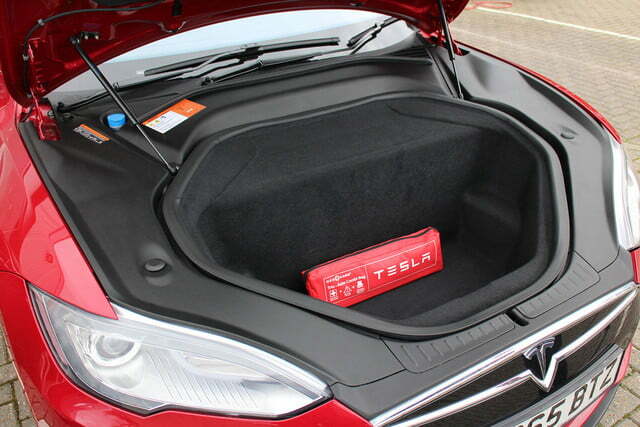 On a full charge, the car will supposedly do around 270 miles, but this will drop the more toys you use (including the headlights, radio, and windscreen wipers), and the more you push the motors. 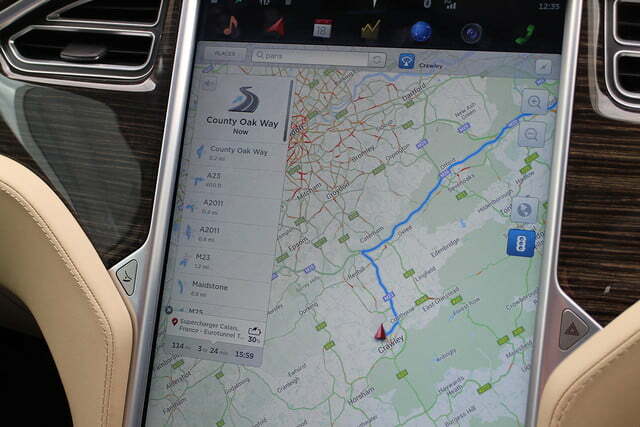 In the U.K., Tesla has 31 Supercharging stations, and a wider network of slower public electric car chargers also exists, but it’ll still mean plotting long trips very carefully. 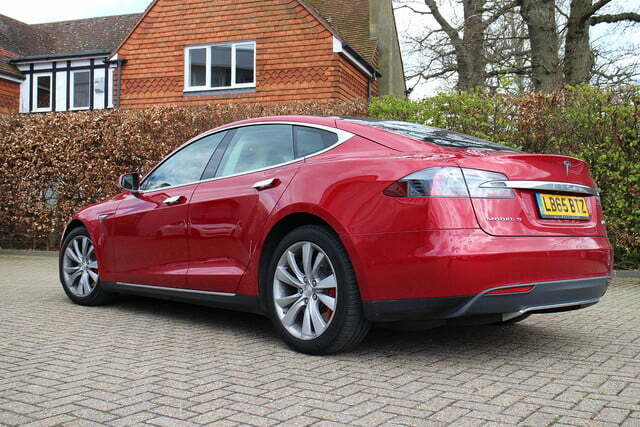 Interestingly, thanks to a generous government grant, having a charger installed in your home when purchasing a Model S is very cheap, so keeping the car topped up overnight shouldn’t be a problem. Plug it into the mains, and it’ll take many hours. Our range experience at this point is anecdotal. We started off with around 215 miles available, and ended with around 175 miles, after doing no more than 25 miles in total. That was a combination of urban and motorway, without the use of any ancillary features, plus a few moments where my foot inexplicably became incredibly heavy. On the surface, it’s perfectly usable everyday, but flexibility to cover long distances in one go is obviously not there. It’ll be interesting to see how it copes over a longer period. Long-range anxiety may send you back into the waiting arms of an internal combustion engine. In the short time we spent with the car, we didn’t build up much of a connection with it either, suggesting a slight lack of personality. Not important to everyone, and something that may change with time; but it costs £55,000 in the U.K., or $118,000 in the U.S., the same as a specced-up, wilder BMW M2 or a stock M3, which will give you goosebumps, even if they lose out in a drag race. 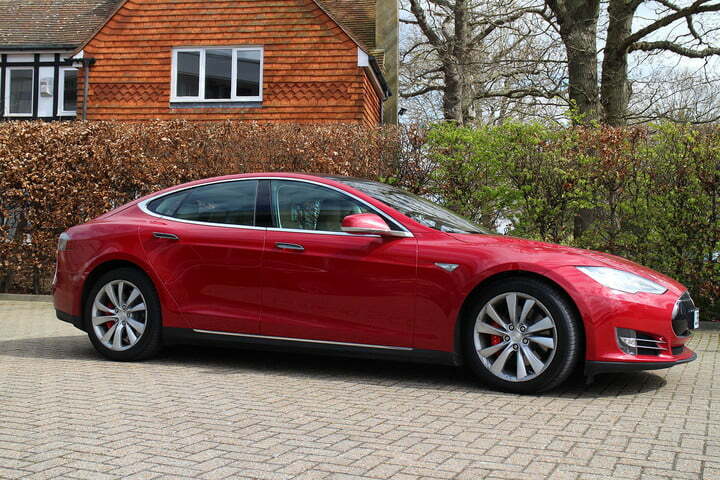 However, owning a car that’s so technically astonishing and screamingly fast, yet so completely normal in every other way, is devilishly beguiling.